BRAMPTON, ON, Sept. 30, 2016 /CNW/ - Loblaw Companies Limited today announced the launch of BPI-certified 100 per cent compostable President's Choice® single-serve coffee pods. The Keurig®-compatible pods are made almost entirely from plant materials and reclaimed coffee bean skins, using Canadian innovation from University of Guelph and Club Coffee of Toronto. With the launch of this innovative product, 100 million President's Choice® and no name® pods sold annually will be compostable in the kinds of large scale composting systems that serve millions of Canadian households†. As the single-serve coffee category has grown exponentially over the past few years, so too has concern about the impact of the waste. 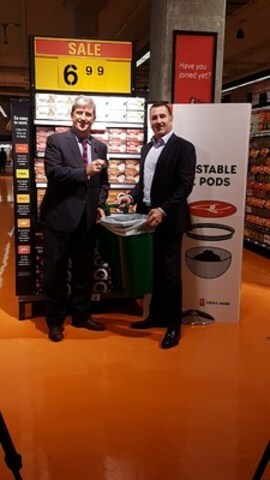 "Our company and customers challenge the notion that convenience packaging is a justification for waste," said Galen Weston, Executive Chairman and President, Loblaw Companies Limited. "We expect this product launch and the Canadian innovation behind it will re-invent the category, helping our customers to enjoy their coffee without sacrificing their commitment to the environment." The President's Choice® brand has made environmental consciousness a brand hallmark for more than 25 years, since the launch of PC G.R.E.E.N® products in 1989. More recently, Loblaw has diverted close to 10 billion single-use plastic bags from landfill, through its pay-for-plastic bag program. The President's Choice® pods are the first single-serve coffee pods to be certified by the Biodegradable Products Institute (BPI), which ensures products meet rigorous independent testing and verification according to international scientific standards for compostability. Compostable pods are easily identified by the BPI logo on pack and by the brown ring on the pod. "I am very pleased to participate in today's announcement to showcase a made in Ontario innovation that will help reduce waste and hopefully encourage further environmentally sustainable packaging solutions," said Glen Murray, Minister of the Environment and Climate Change. "A priority of the Government of Ontario, through the recently passed Waste-Free Ontario Act, is encouraging innovation in consumer packaging, eventually moving towards a circular economy in Ontario. Today's announcement is a great example of that innovation in action." "The President's Choice® brand offers Canadians world-class products without compromise, and we know that a great convenient coffee shouldn't have to come at a great environmental cost," said Ian Gordon, SVP, Loblaw Brands Limited. "Through Canadian collaboration and innovation, we're launching a game-changing solution to an environmental challenge facing millions of households." This is just one of the many initiatives Loblaw is undertaking as part of its corporate social responsibility efforts. The company focuses on activities related to sourcing, community and the environment, in areas where it can make the biggest difference. Details on this and other initiatives are outlined in the 2015 CSR Report, which can be found online at www.loblaw.ca/csr. †For collection in municipal programs. These coffee pods may not be accepted for composting in your area. Loblaw Companies Limited is Canada's food and pharmacy leader, the nation's largest retailer, and the majority unit holder of Choice Properties Real Estate Investment Trust. Loblaw provides Canadians with grocery, pharmacy, health and beauty, apparel, general merchandise, banking, and wireless mobile products and services. With more than 2,300 corporate, franchised and Associate-owned locations, Loblaw, its franchisees, and Associate-owners employ approximately 192,000 full and part-time employees, making it one of Canada's largest private sector employers. Loblaw's purpose – Live Life Well – puts first the needs and well-being of Canadians who make one billion transactions annually in the companies' stores. Loblaw is positioned to meet and exceed those needs in many ways: convenient locations; more than 1,050 grocery stores that span the value spectrum from discount to specialty; full-service pharmacies at more than 1,250 Shoppers Drug Mart® and Pharmaprix® locations and more than 500 Loblaw locations; PC Financial® no-fee banking; affordable Joe Fresh® fashion and family apparel; and three of Canada's top consumer brands in Life Brand®, no name® and President's Choice®. Through the PC Plus® and Shoppers Optimum® loyalty programs, more than one in every three Canadians are rewarded for shopping with the companies.